Catalogues and Bulletins reaching back to the beginning of the University list at least ten general usage phone numbers and exchanges for the outside caller seeking to reach someone on campus. Though the very first phone number was not even a number at all. 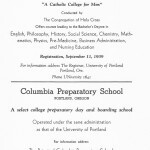 In 1901-1902 callers would simply pick up a telephone and ask an operator to be connected with “Columbia University”. There was likely just one phone in West Hall (the only building then, now Waldschmidt Hall) and by the mid-1920s (with two campus buildings!) 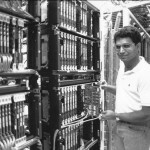 there were two or three phone lines serving the campus, including a pay telephone in Christie Hall. 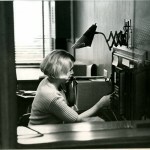 A switchboard operator fielded calls placed to the University at UNiversity2626, UN1641, TWinoaks 8841, TW5541 from the 1930s through the mid-50s. 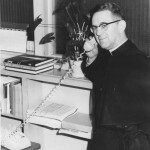 The expanding demand for telephone service in the 1950s ushered in a 7-digit number-system nationwide and the university’s number changed to BUtler 9-5541; the West Hall UP switchboard then successively becomes 289-5541, 286-7911, 283-7911 through the 1960s. Today, cell-phone demand has created a ten-digit system, and we are 503-943-8000. 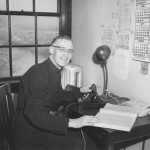 The first private telephone in a dorm room was installed in 1957 in Christie Hall by sophomore student, Don Gorger. In 1966, The Beacon notices that phones were installed in all rooms in Mehling Hall. 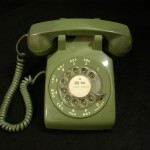 The University provided phones for student rooms until about 1985. Portland Magazine reports 1,415 telephones on campus in 1993: 800 for faculty and staff; 600 for students; and 15 pay phones. Today (January 2016) Information Services reports there are 956 VoIP telephones running on the University’s network: 946 for faculty and staff; 10 for students. There are no pay phones operating on campus. And no count at all accounting for wireless mobile devices, which seem to be issued in multiples far in excess of one per-person. 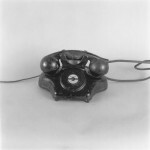 Additional photographs and artifacts about telephones are on display on the first floor of Buckley Center (across from the Studies Abroad Office) until the end of February 2016. Thanks for putting this together. Fascinating as always!